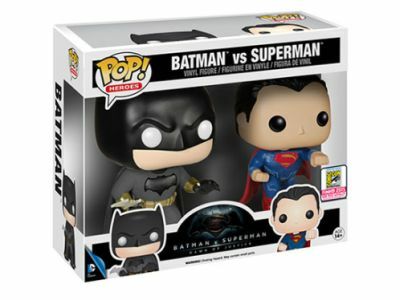 Funko has fully revealed their slate of San Diego Comic-Con exclusive toys and collectibles featuring some of the first ever Batman v Superman: Dawn of Justice merchandise. You can check out the full gallery of figures, ranging from “Arrow” and “The Flash” to Big Hero 6 and Deadpool, below and try to snag your own at booth #5343. Batman v Superman: Dawn of Justice stars Henry Cavill in the role of Clark Kent/Superman, and Ben Affleck as Bruce Wayne/Batman. The film also stars Gal Gadot as Diana Prince/Wonder Woman, with Amy Adams, Laurence Fishburne and Diane Lane returning from Man of Steel, Jesse Eisenberg as Lex Luthor, Jeremy Irons as Alfred, and Holly Hunter in a role newly created for the film. Jason Momoa will also be making an appearance as Aquaman. Written by Chris Terrio, from a screenplay by David S. Goyer, the film is produced by Charles Roven and Deborah Snyder with Benjamin Melniker, Michael E. Uslan, Wesley Coller, David S. Goyer and Geoff Johns serving as executive producers. Batman v Superman: Dawn of Justice is set to open worldwide on March 25, 2016.